Here, north of the border, we’re about to celebrate Cinco de Mayo, quite a gringo holiday, bigger than celebrated in Mexico. Not everyone knows why we mark this day so heartily, but the chips, salsa, and beer are front and center and we’re all looking forward to some good Mexican food. Have you ever noticed that many Mexican dishes feature red, green, and white colors, mimicing the stripes in Mexico’s flag? 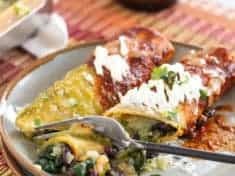 For instance, these mouthwatering enchiladas waving red sauce on one side and green sauce on the other, with creamy white drizzles down the middle. ¡Viva Mexico! Feel free to use either canned black beans or beans you’ve cooked from scratch. 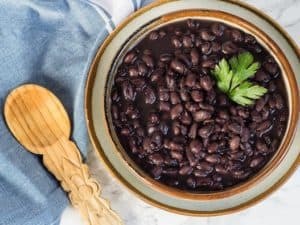 Here’s how to cook black beans in the pressure cooker. To make it easier, bathe your enchiladas in 2 cups of one sauce, either red or green. Choose either purchased or homemade enchilada sauce. Here’s my recipe for homemade green enchilada sauce. And my homemade authentic red enchilada sauce. Whenever you cook leafy greens like spinach, brighten them with something acidic. The apple cider vinegar in today’s enchilada filling does just that! If your store sells them, try Mi Rancho organic corn tortillas. Their old-world rich corn flavor and hearty texture makes stellar tacos and enchiladas. 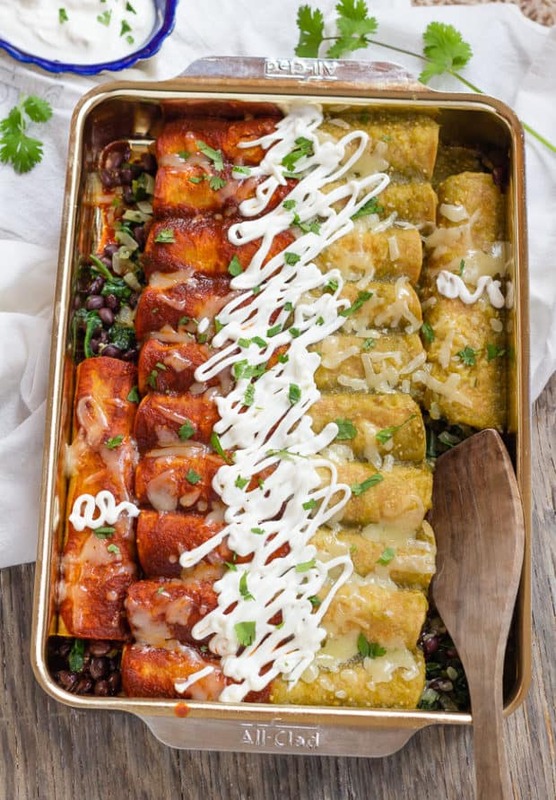 Chard enchiladas with black olives, green onions, and feta cheese. Chile relleno enchurritos, made with flour tortillas. 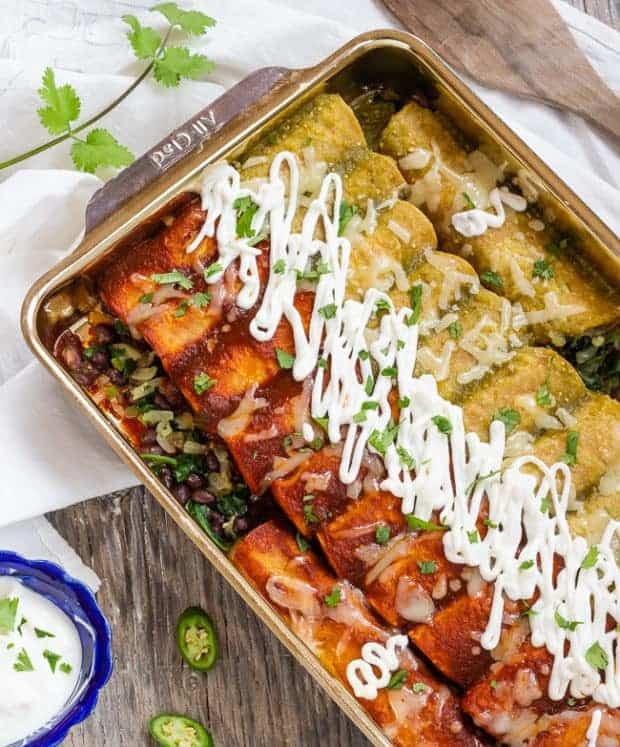 Stacked mole-sauced enchiladas—tortillas, spinach, potatoes, and carrots— layered like lasagna. Chard and pepper jack quesadillas with avocado crema. You’ll love these vivid red hibiscus margaritas, too. You’ll love these with a salad with jicama, grapefruit, and cumin-lime dressing. Happy Cinco de Mayo! Put on your apron and whip up something delicious and celebratory! For a photo sequence assembling these enchiladas, check out the circle labeled “Enchiladas!” in my Instagram profile. 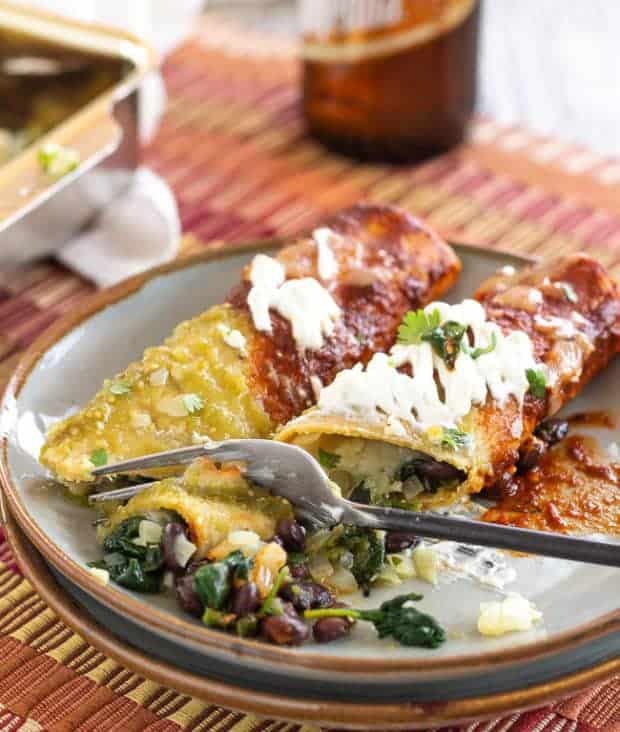 Go all out with cooked-from-scratch beans, garden spinach, and homemade sauce, or make it super easy with canned black beans, baby spinach, and purchased enchilada sauce. Bathe your enchiladas in either red or green sauce, or both, like in the photos. Serve with a crisp green salad with cumin lime dressing. Makes one large casserole, serves 6. Add the cilantro, oregano, and salt; cook and stir a few more minutes. Stir in the black beans. Season with the vinegar. Taste, adding more salt if you think it’s needed. Pre-heat oven to 350° F. Spray or rub a small amount of oil in a 9 x 13-inch baking dish. Spread about ¼ cup enchilada sauce on the oiled dish. Place tortillas on baking sheets, 6 tortillas to a pan. Lightly spray both sides of the tortillas with cooking spray. Bake about 5 minutes, until pliable. 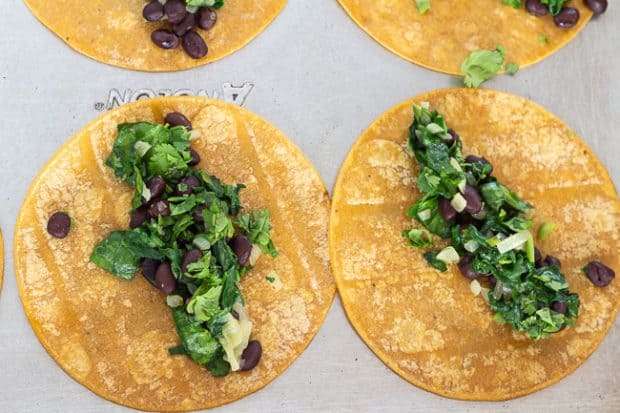 Sprinkle 3 to 4 tablespoons of the spinach and bean mixture down the middle a softened tortilla. Sprinkle about the same amount of cheese on top. Roll the tortilla around the filling and place it seam side down in the baking dish. Repeat with the rest of the tortillas. You can cover the pan at this point and refrigerate overnight. Pour the enchilada sauce over the rolled tortillas, making sure to cover the ends. You can use all red or all green, or give your enchiladas the Mexican flag color with both, one sauce on each side. Sprinkle with more cheese. Cover and bake until heated through, 20 to 25 minutes. Spread the Greek yogurt down the center of the pan and sprinkle with chopped cilantro leaves. (I used a pastry bag to squiggle on the yogurt. 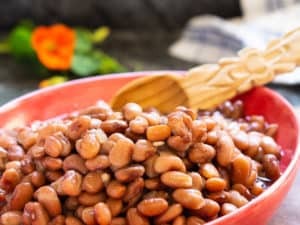 Canned black beans or home-cooked—it doesn’t matter. That said, I’m a huge proponent of cooking beans from scratch—especially using a pressure cooker. 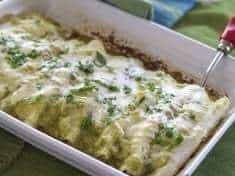 You can bathe your enchiladas in either red or green sauce, or both, like in the photo. Enchilada sauces can be homemade or store-bought. For many years, I used canned red enchilada sauce, but since I’ve become more of a label reader, I can hardly bring myself to use buy it. Not that I don’t on occasion. 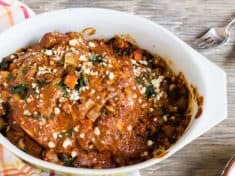 😉 Looking around, I did find a cleaner ingredient red enchilada sauce online. The same for green enchilada sauce, use homemade or storebought. Tip: For the photo, I cooked 2 small cans of green salsa in a saucepan until the liquid reduced to a sauce about as thick as the red enchilada sauce. If you like this recipe or find it useful, I’d so appreciate a 4 or 5 star rating. Rating is done by clicking on the stars above. ** This is an update of the spinach and black bean enchilada recipe I migrated over from my old muffintalk blog. Now with photos.